Granola is so easy to make that I find it almost as easy to forget to make, even when the ingredients are right under my nose. It is one thing I have never bought from the store – it’s overpriced, there & usually contains ingredients we don’t want. Here’s a good granola I make with dried mangoes, whenever I find these delicious dried, Hawaiian mango slices at our grocery store. We can’t get fresh Hawaiian mangoes, but it’s nice to have the dried ones, especially unsweetened. Last year, we didn’t get to eat as many fresh mangoes either, so this is a great way to make up for that. 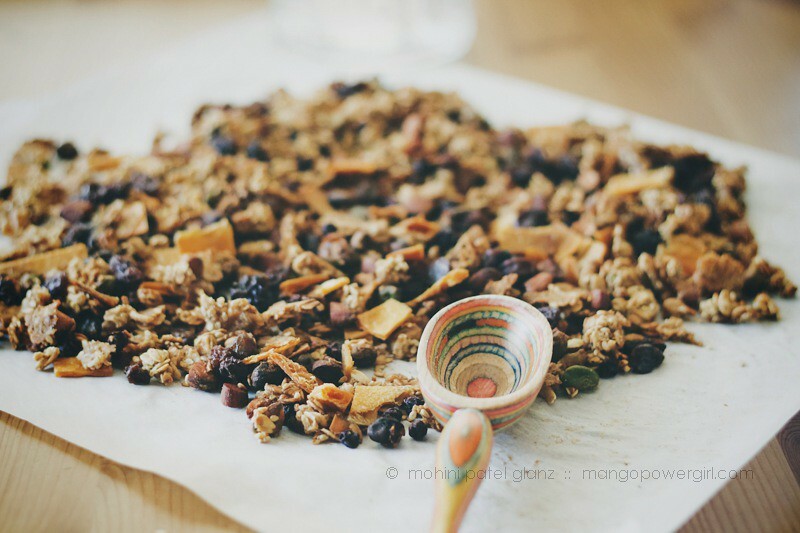 To be fair to the local fruit in Seattle, we do get the best blueberries I’ve ever eaten, hence the dried blueberries we get here are absolutely delicious and they compliment the mango perfectly in this granola. Husband loves blueberries and I love mangoes, so this is the perfect match for us! 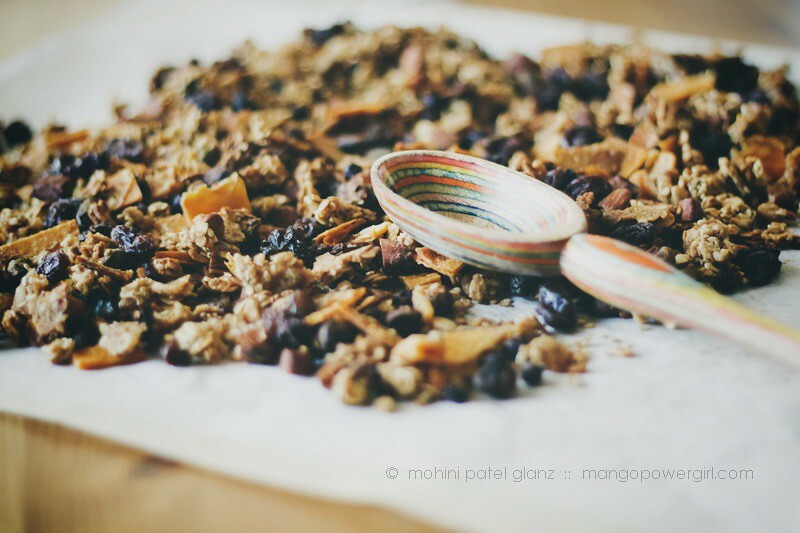 I generally have ingredients for granola because of the bulk nuts and dried fruits at our local markets and grocery stores. I love changing up the combination, the recipe never fails! In winter when you can’t find as many seasonal fruits, dried fruits are satisfying and good for you. Finally, in an effort to eat more breakfast and satisfy my snacky sweet tooth in a healthier way, this is a note to self: make granola more often! 1. Preheat the oven to 325 F (170 C). 2. In a large bowl, combine all the ingredients except raisins, blueberries, and mangoes. 3. Toss to make sure everything is evenly coated with the liquid. 4. Layer evenly on a lined baking sheet and bake. 5. Bake for 40-45 minutes, rotate the tray once in the middle instead of stirring, until everything is toasted nicely! You’ll get nice big clusters that you can break down with your hands when done. 6. Let it cool, then add the raisins, dried blueberries, and dried mangoes. 7. Store in an air tight jar at room temperature for up to a couple of weeks if it lasts.